If you are anything like me you LOVE putting up decorations but taking them down not so much! This year I decide that while I am taking them down I will organize and label all the storage totes! I always group my decorations into categories while putting them into totes for ease while decorating next year. I've tried using my label maker to label my totes, but they fall off every time I've used them! So this year I created my own fun labels that I will be putting on using packing tape! I got the idea to use cute decorative circles to label totes from Typical Suburban Family where I downloaded my baby storage labels. Why I haven't gotten the idea to expand to all my other storage is beyond me! So today while cleaning up I decided to create some storage labels for you to download and use for FREE!! 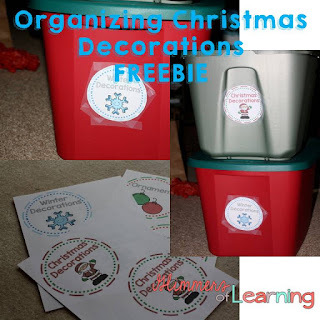 In the pack you will find a label for Christmas Decorations, Winter Decorations and Ornaments. I decided to create a separate winter decoration label because there are some decorations I leave up past Christmas, such as: snowman and some snowflake decorations. I suggest using clear packing tape to adhere these to your tote, of course I didn't have any so I used scotch tape and you can see it is obvious that they were taped on. With the packing tape you will barely notice that they are taped on. Click on any of the picture or RIGHT HERE to take you to my freebie! I plan on creating more labels for Halloween, Valentine's Day, Fall, Thanksgiving, etc. But first I need to clean up my Christmas decorations!